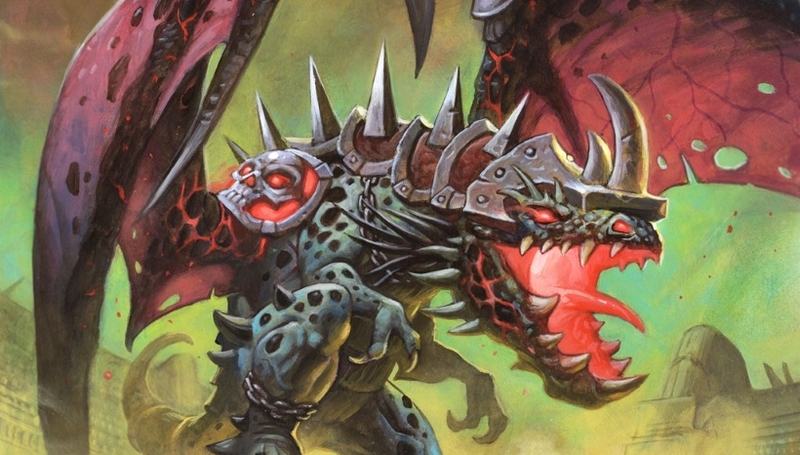 Our Dragon Warrior deck list guide features the best Rise of Shadows deck list for Season 61 of Hearthstone (April 2019). Our Dragon Warrior guide also contains Mulligan advice, card combos and strategy tips. There hasn’t been too drastic a change in good fortune with the release of Rise of Shadows, either. Other Warrior decks, such as Bomb Warrior and Control Warrior, have been the dominant picks on ladder, though players out there are still trying to find ways to make Dragon Warrior work by borrowing elements from both of these other deck types. Here’s a new version of Dragon Warrior currently in Hearthstone. It’s win rate is respectable, but it’s not been played much so the numbers could be skewed in it’s favour for now. Playing in a similar style to Control Warrior, this version of Dragon Warrior aims to survive well into the late game with armour gain, execute effects and board clears so the Warrior can reach their most powerful high mana minions. Once here – and with the opponent starved of all resources – the Warrior can take the initiative in the match and steadily work down their opponent’s life total. Where in the past the cards like Shieldmaiden would have been used for Armor gain, it finds a replacement here in Emberscale Drake. Meanwhile, the nerf to Execute doesn’t seem so bad when you can just run Smolderthorn Lancer in its place to get the same effect, plus a 3 / 2 minion. These are the sorts of additions that can make the deck more viable. Meanwhile, it’s late game options are borrowed from current Control Warrior to give it a powerful finish. Early game: Slow and steady is the way for Dragon Warrior, with an early game focused on armour gain and card draw. You should start playing by Dragon Roar in order to add more Dragon minions to your deck to be used as activators for useful upcoming cards such as Smolderthorn Lancer and Emberscale Drake. Meanwhile, Weapons Project is a decent way to generate a bit of extra armour, while it also gives you a weapon to use to kill off your opponent’s low health creatures. Mid game: If your hand is full of Dragon minions, then you’ll want to see about dropping Emberscale Drake in order to maintain a healthy armour value if you sense the game is going to go late. You can also use Warpath and Dyn-o-matic as activators for Smolderthorn Lancer to destroy some of your opponent’s bigger minions that might start coming down now. If you’re already behind, though, Dragon Warrior has a number of good catch-up cards at this stage. Of course, there’s an old favourite with Brawl, while Zilliax can zoom onto the board and have an immediate impact. Supercollider is also an excellent weapon to thin out a larger board. Late game: Now you can truly assert control of the game. Any remaining minions your opponent has on the board can be swiftly dealt with by the Battlecry effect from Crowd Roaster. Your late game finishers include Dr. Boom, Mad Genius, which will grant you a rotating hero power with multiple handy uses and pairs perfectly with Omega Assembly. Elsewhere, Archivist Elysiana can give your deck some extra bulk if you feel the match is going to Fatigue. 1. You have multiple area of effect spells that can wipe out most wide aggro boards, especially if you repeatedly cast Warpath. 2. If things get seriously bad you can always play Brawl to reset the board against your opponent. 3. Be cautious of playing Weapons Project against aggro. It can work in your favour and destroy one of their more useful weapons, but you could also be giving them extra damage to finish you off quicker. 4. Don’t be afraid to use Smolderthorn Lancer on smaller minions if needed, as aggro will not have many big threats to target in the game. 1. These match-ups often come down to whoever blinks first, loses. Be patient and focus on your armour gain or card draw in the early stages. 2. When their big threats start to come down, use one of your many single damage effects to set them up for an execution from Smolderthorn Lancer. Use it wisely against the most dangerous targets though. 3. Once you get Dr. Boom, Mad Genius down you have a lot of reach for the rest of the game thanks to the cycling hero power. Similarly, Archivist Elysiana can keep you full of resources in your deck. 4. Definitely hold off on playing Omega Devastator until Turn 10 as you don’t know when a control deck might have another big threat for you to deal with in the late game. 5. Hold off on casting Weapons Project until your opponent commits to a powerful weapon themselves. It’ll function as pseudo-removal by replacing their weapon with an inferior one. Or just go for Harrison Jones! 1. Dragon Roar: In your slow early game this is fine to hold onto to start getting additional Dragon minions into your hand. 2. Weapons Project: Gives you a nice Armor boost and a solid weapon to remove early game minions. 3. Dr. Boom, Mad Genius: It’s extreme late game power means you might want to hold onto it in your opening hand if you have one or two of the cards above as well. 4. Shield Block: In the quiet early game of Dragon Warrior this can give you some much needed card draw. Plus, the Armor is nice too! - Smolderthorn Lancer requires you to have a Dragon in hand in order to activate the bonus execute effect, which should be more than achievable considering the cards in this deck list. - Dragon Warrior is full of ways to deal one damage to all minions, which is handy for enabling the execute effect on Smolderthorn Lancer. Pair it up with Warpath and Dyn-o-matic where possible. - For gaining armour you can use Emberscale Drake, but make sure you have a Dragon in hand before playing it or you’ll miss out on the effect. - When you play Archivist Elysiana for some late game reach, try to target some of your biggest or most impactful cards to keep you in the game for longer. Dragon Roar and Omega Assembly are two key choices. These are some of the most important cards in the Dragon Warrior deck, as well as a few options for replacements if you’re missing some in your collection. Shield Slam: With the multitude of ways to generate Armor in the deck, this spell serves as a powerful removal tool. Dragon Roar: Adds two random Dragons to your hand, which is especially useful for providing more possibilities to activate the Dragon synergies in this deck. Emberscale Drake: Back in the day, Shieldmaiden was an excellent card with an identical armour-generating effect. Emberscale Drake cuts the cost by one but requires you to have a Dragon in hand, which should be consistently achievable in this deck. Smolderthorn Lancer: The nerf to Execute hurt old Dragon Warrior considerably, but this minion grants you the same effect while putting a 3/2 body on the board. Feel like an easy auto-include in any Dragon Warrior deck. Omega Devastator: More removal for the deck, but this one you’ll need to hold off until Turn 10 for it to be useful. Brawl: A staple of Control Warrior decks since the dawn of time. Very powerful against aggro and can get you right back into any game where you’ve fallen behind. Supercollider: A unique weapon that can help you deal with creatures that are otherwise out of reach of a pain to remove with direct attacks. Zilliax: This keyword-heavy minion has found its way into another deck. Works in Dragon Warrior as a way to get you back on the board if you’ve fallen behind against aggro. Crowd Roaster: You’re essentially paying seven mana to kill most minions with the Battlecry effect, but you also get a chunky seven-attack creature on the board too. The low health is a downside, but you can’t deny the power of the Battlecry. Dr. Boom, Mad Genius: The Mech synergy in this deck is fairly low but Dr. Boom, Mad Genius is still a handy addition to the deck for the rotating hero power it grants you when played. Archivist Elysiana: Can help bulk out your deck some more once your draw pile is starting to look a bit thin so you survive much longer in games heading towards Fatigue. why should I go for this when like 90% of the cards in this deck are odd? I can simply go for odd warrior instead, the only way I see this deck working is because of Voone and maybe a high roll for Emeriss granted from dragon roars from deck looks fine but sadly there is a better option that outmatches this archetype. I'd consider putting a deadman's in this just for the outlast value. bad matchups for this deck? Dont see any point to Frothing Berserker to be honest. 2/4 with damage potential but only if you already have minions out. Blood to Icor only provides +1 and is better used for tempo or Gromm activations. @DeathHelmet I think you should probably slot in your biggest, baddest end-game minion in there. I think this deck was pretty well-optimised before the release of Karazhan. Any tweaks you see now are largely a case of looking at the overall deck list and see what could go - to accommodate the new cards - that would cause the least disruption to that optimisation. Taking out a Ravaging Ghoul may or may not turn out to be the correct choice. This deck list could look very different after a month or so of Karazhan play, especially now that all of the cards are out. Why only 1 Ghoul ? Is it possible to use this deck without deathwing? Is Finley really necessary ? I want to add 1x Brawl to counter Zoo or N'Zoth Decks.